My parents celebrated their 50th wedding anniversary this past weekend, on the 17th. I think that’s a pretty big deal. And I’m particularly excited that they got married, because otherwise we would not have been able to celebrate that milestone on Dauphin Island a couple of weekends ago. Nor would I have been born, which was pretty important, too – at least to me. If there is any activity that makes me hungry, it is swimming. I’m not sure that floating around in the ocean or excavating the moat around my sand castle counts as real exercise, but somehow I got pretty hungry anyway. Our lunches in the condo were tame but plentiful – sandwiches, chips and dips followed by two limited edition flavors of Golden Oreos– lemon crème and birthday cake. (Nothing really beats an original Oreo, but I try not to let a new flavor come along without trying it at least once.) As a side, I had a few bites of West Indies Crab Salad I’d picked up at Bayley’s restaurant on the way to the island. It’s basically just crab meat and onions marinated in cider vinegar, oil and cold water, invented by Mr. Bayley back in 1947. Simple but tasty, and also a check mark off one of my eat-it-before-you-die lists. Our second evening there was family photo night. We all donned our white tops and khaki bottoms and took as many shots as possible before dark-thirty, then caravanned to dinner. Despite the legion of culinary options in Mobile, we chose to forgo the long drive and went across the street to Islanders. We started with a big plate of fried crab claws, another family Dauphin Island tradition. I should have been wary when it said “market price”. But hey, we were celebrating. For the main meal I found myself in a menu dilemma. 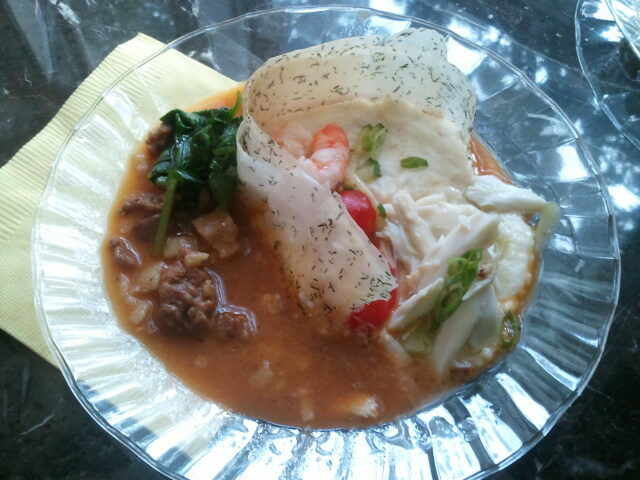 They had shrimp and grits, a dish that always grabs my attention. Even when there are other enticing selections, I always wonder “what amazing rendition of shrimp and grits might I miss if I don’t order it here?” The other option I was considering was a pork ribeye, which I had never seen on a menu before. I figured I was at the beach so the seafood choice was the logical one. The shrimp and grits were decent – they had little bits of Conecuh sausage mixed in, too, which added to the Alabama-ness of the whole thing. The next morning was play-time in the kitchen. Younger brother made pancake bites – little mini-muffins made from pancake batter, served with syrup. I brought along my deep fryer and made donuts from canned biscuits – buttermilk Grands with a hole cut out of the center. I’m not usually a big fan of canned biscuits, but when you deep-fry them and pour on the glaze, they take on a new personality, one I would like to spend more time with. So we had pancakes that were muffins and donuts that were biscuits. Twisted but fun. At dinner we went back to the ocean, so to speak. Skinner’s Seafood, just down from the hotel, provided us with local grouper filets – some we fried and some we blackened for fish tacos. We also brought home steamed shrimp, which Younger Brother combined with an oven roast of corn cobettes and the tiniest little potatoes I’ve ever seen, for a spin on a low country tradition. Needless to say, we ate long and well. Again. Thank goodness I got up at dawn to run ten miles on the beach every morning. Right. Dessert was chocolate cobbler and homemade vanilla ice cream which didn’t really want to freeze. It was more like vanilla milkshake poured over chocolate cobbler. But does that sound bad? Nope. It was just fine. After a quick snack breakfast the next morning we checked out and headed for the end of the island to catch the ferry over to Gulfshores. While we waited, we all got ice cream at the little monopoly shop at the ferry departure point, because it’s never too early in the day for ice cream. Besides, it was hot, and that Coke float was just what Dr. Jay ordered. Literally, that’s what I ordered. They didn’t get it wrong. Younger Brother and fam headed to points east, while we cut north to Foley. We had some last-minute school shopping to do at the outlets, and had our sights set on Lambert’s Café for lunch. Since we’d just had ice cream, we waited till mid-afternoon to go and the parking lot was still packed to the gills. Once we were seated, they began bringing the “pass-arounds” – fried okra that they spoon out on the middle of the table on a paper towel, and the famous “throwed rolls”. 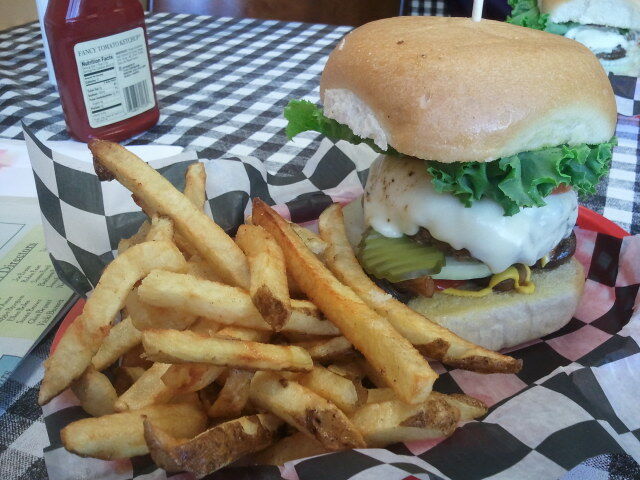 If you haven’t been to Lambert’s before, you need to be a little wary. They throw the rolls. Across the room. They are amazingly accurate throwers, but one toss to Son ended up smacking me directly on the right ear. Another hit Doc on the head, split in two, sending one half spinning directly into Daughter’s hands. The Wife took one for the team directly on the chest. And the food just kept coming. I considered sustaining myself solely on the pass-arounds – macaroni with tomatoes, black-eyed peas, cabbage, fried potatoes with onions. That would have more than filled me up. But I noticed they had deep-fried hog jowls. How could I not order that? The server described them as similar to thick-sliced bacon, and that’s essentially what appeared – a plate full of curled pieces of thick fried bacon. Wow. I’d love you to believe that I came home and ate low-fat yogurt and salads with no appreciable dressing for the next week, or that I actually ran those early-morning miles on the beach. But some of you have seen me since that weekend and you know better. It was worth the sacrifice to celebrate such a big day. Happy 50th, Mama and Daddy! Everyone should have milestone memories of childhood summer vacations. 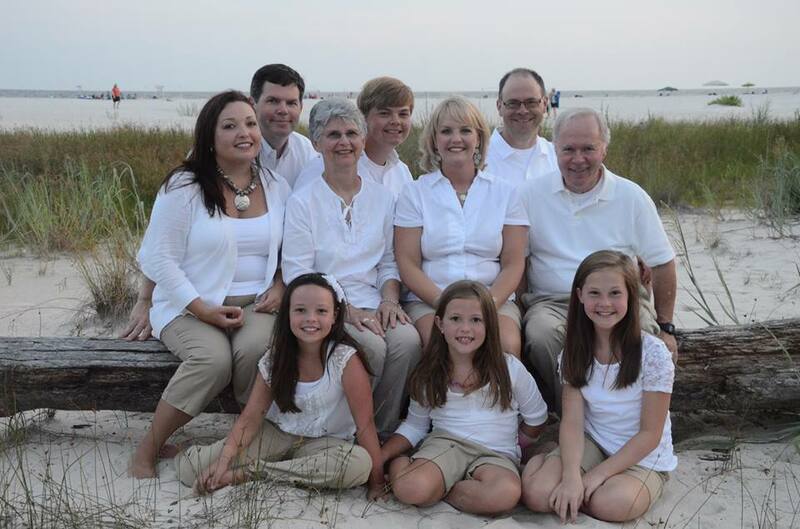 We had some great ones, but my earliest revolve around family trips to Dauphin Island, Alabama. I don’t remember the first time we went – I was but a wee lad, after all – and without studying hurricane history I can’t pinpoint the year we started going elsewhere (though I think it had something to do with the Holiday Inn blowing into the Gulf). But I do know that it was our standard vacation for several years running. Some of the details are fuzzy, but I remember little bits about playing on the beach, visiting Fort Gaines and the USS Alabama, and hearing on television that Elvis had died – Mama didn’t believe me. Some of my more vivid memories, not surprisingly, have to do with what and how we ate on those early trips. We always took a cooler and an electric skillet, so Mama could cook in the room. Other regular passengers were Vienna sausages and saltines, since they travelled pretty well. A special treat was the deviled ham – it wasn’t something we ate at home very often. We did eat out at a restaurant in Bayou le Batre called Mary’s Place, where I learned to love fried crab claws. My folks remember chickens and other barnyard animals hanging around the parking lot. Farm to table, indeed. All this reminiscing is not just random. The memories have been revived because we finally went back. It took us around thirty-five years to do it, but we made it, just in time for an early celebration of The Folks’ 50th wedding anniversary. Younger Brother and his family, The Folks, and my crew crammed ourselves into a condo which just happened to be on the same property where the Holiday Inn once stood. How cool is that? Pretty cool, if you ask me. As you have come to expect, we took care to fill up the celebratory weekend with good eating. But we had to get there first. We weren’t able to check into the condo until mid-afternoon, so we decided to stop for lunch in Mobile. At this point on the trip there were eight of us in the caravan: The Folks, The Wife and I, Son and Daughter, and Younger Brother’s dual offspring-ettes, Thing 1 and Thing 2. That meant we had to find a place that would please a multitude of appetites. 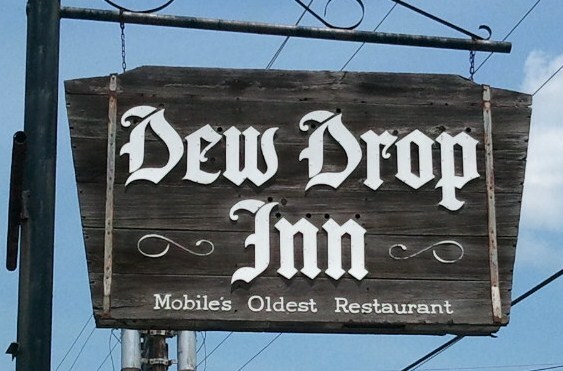 I found the Dew Drop Inn on my handy-dandy list of must-eat dishes in Alabama and asked Mama (since she wasn’t driving) to locate it. It turned out to be only a few blocks off the beaten path, and was known for hot dogs and hamburgers – convenient and simple, the perfect combination for our travel party. The Dew Drop Inn has been around in some form or fashion since 1924, and bills itself as Mobile’s Oldest Restaurant. Even more interesting to a food enthusiast like me, it may well have been the restaurant that introduced the hot dog to south Alabama. And though the menu was extensive, I stuck with tradition. The World Famous Dew Drop Inn Hot Dog is a bright red frank (that concerned Thing 2 just a little, but she was able to get past it in the end) on a toasted bun, dressed with chili, sauerkraut, ketchup, mustard and a pickle slice. They’ll fix it however you like, but when I order someone’s signature dish, I like to get it the suggested way. There were a lot of flavors popping in the mouth with this dog, as you can imagine just by reading the toppings – and I thought they all worked well together. 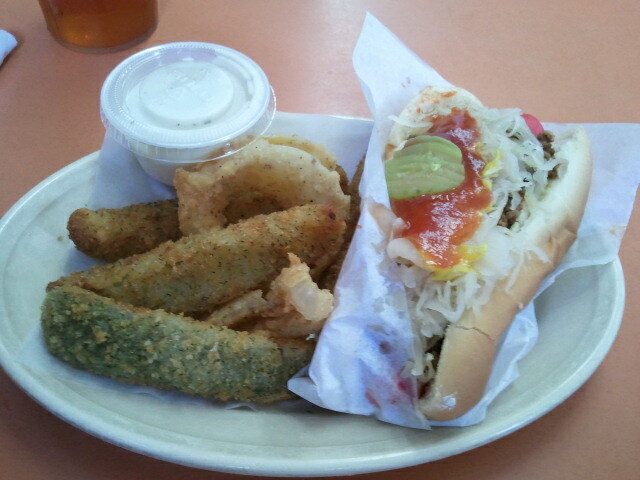 Thing 1 got some onion rings (also highly rated) so I enjoyed a few of hers in addition to my fried dill pickle spears. The Wife got a Dew Drop cheeseburger, which supposedly is the one that inspired Jimmy Buffet’s love for burgers during his boyhood years in Mobile. History can be fun, especially when you get to eat it. Younger Brother is a food enthusiast much like me. Whenever we get together, we end up swapping ideas and stories about places we have been and what we’ve eaten there. Together we have discovered some memorable places, but on this trip we chose to maximize the family time by preparing most of our meals in the condo. What did that mean? It meant that together we brought enough food to last the ten of us about a week. We stayed three nights. But we had lots of variety, and we didn’t go hungry. It worked for us. Night one was Mexican night, primarily sponsored by Younger Brother and fam. He brought chicken and ground beef and all the fixings for tacos; I contributed some green onion sausage from Jerry Lee’s Cajun grocery in Baton Rouge – it was as close as I could come to chorizo on short notice. For dessert I had a grand idea: all three families would bring an ice cream freezer, we’d make three different kinds of homemade ice cream on the first night, and eat it all through the weekend. Alas, that didn’t happen, but we did whip up a freezer of strawberry to cool off our palates after the spicy dinner. It lasted, oh, about one night. The next morning we had one of our two meals out. We had done our research, and found that the place with the best reviews on the island was breakfast at the Lighthouse Bakery. We kinda’ went crazy. The signature pastry was the cinnamon roll, so we got a few of those (plain and pecan). 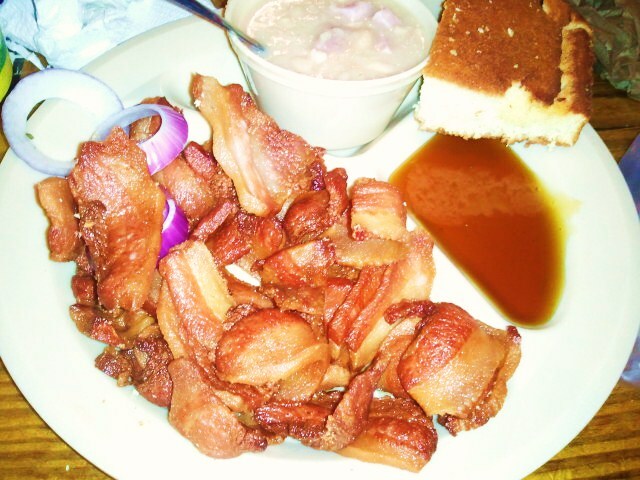 On the savory side, we snagged a drove of little pigs-in-blankets and some bacon-wrapped twisted rolls. (Breakfast equals pork, right?) A few cheese and raspberry-filled danishes, lathered in decadent icing, brought us back to the sweet side along with a couple of fruit turnovers. That gave us enough energy to pack our snacks for the beach and start thinking about lunch. I’m not exactly sure how to describe the past week or so. Aside from Forks and Corks a couple of Saturdays back, I didn’t go into it with a lot of high culinary expectations. But it still turned out to be a tasty – and memorable – week. Forks and Corks rounded out our Saturday evening, but the day actually started at the Starkville Community Market early that morning. My usual habit is to get breakfast there – the specifics depend on the wares of that day’s vendors. Could be a chocolate chip scone, could be a cinnamon roll, could be a sausage-bacon-cheese muffin, could be a bag of biscuits. Usually not all of the above. Usually. To wash it down, could be mint lemonade, strawberry limeade, blueberry juice, or free coffee. But you have to get there early or all the fun drinks disappear. This week one of my favorites showed up: glazed orange scones from The Way to Go. I carried that and a mug of coffee down to the demo tent where Veranda Chef Jay Yates was setting up his temporary kitchen. He took pink-eye purple hull peas and green beans from Lancaster farms, added a little onion and pork belly, and served that over a semi-genuine hoecake. (It was genuinely good – just not cooked on a hoe.) 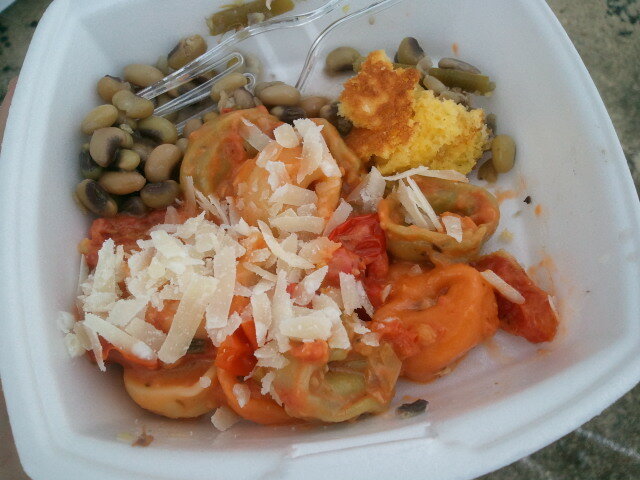 Next up was a pasta dish – tortellini tossed with a variety of local tomatoes and a little parmigiano reggiano cheese grated on top. Not your ordinary breakfast fare, perhaps, but still not a bad way to kick off the day. Fast forward to Sunday night. I went to a party that featured watermelons and MSU ice cream. After eyeing the ice cream options, I knew which one I would choose first. Muscadine Ripple. I haven’t done an exhaustive search for this flavor, but I’m going to go out on a limb and say there is a good chance you can’t get it anywhere else on the planet. And it’s good stuff. Besides the fact that MSU helped pay my way through the first 23 years of my life, I am also thankful for the cheese and ice cream. As for the watermelon, I ate a piece towards the end of the evening, then – out of the corner of my eye – I spotted the host cutting up one with yellow meat. (Who decided that we should call it yellow-meated, by the way? Yellow “flesh” doesn’t sound much better. We should work on that.) Regardless of the terminology, I am a big fan of watermelons with yellow edible innards. I was happy to see it, as were some of the international students at the party who saw one for the first time. On to Tuesday. I had a lunch appointment and was given the option of choosing the location. The topic of discussion was to be food-related, so I wanted a place that was a notch or three above run-of-the-mill. It just seemed right. As it happened, Brian Michaels Burger Company was directly between our two places of business and it had been way too long since I had eaten there. I was impressed with the extensive menu but decided to stick with the standard, and ordered a cheeseburger. When it arrived, I’m sure my eyes told the tale of my disbelief. Never, ever have I been served a burger that tall. Sometimes with a skyscraper-like burger you can push it down to a manageable level from the top bun. Not this one. I pushed, and I tried to get my mouth around it. Nothin’ doin’. I had to hit the first few bites from an angle just to get anything. This is not necessarily a bad situation. Though there can be something special about getting all elements of a burger in one bite, it’s not a terrible thing to get a different taste experience in every bite as long as said taste experiences are all good. And with a Brian Michaels burger, that’s the way it is. What I didn’t realize until halfway through the meal was that this might be the last Brian Michaels burger I would ever have. By the time this is published, it will be closed. And it will be missed. I know I’ve got a big mouth but…really? Late Tuesday afternoon I had to go to Tupelo. When my business was done, it was about dinner time. Though I wasn’t starving (thanks to the Goliath-inspired burger at lunch) I decided to go ahead and eat dinner in Tupelo so I wouldn’t be eating too late. (Somewhere in that decision was hidden a health-conscious choice.) 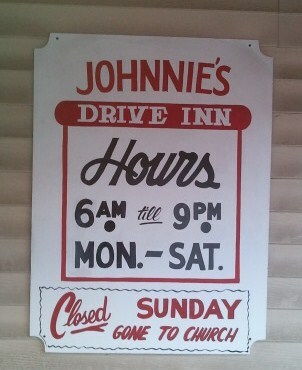 I happened to be on the same street as Johnnie’s Drive-In, the oldest restaurant in Tupelo, so I headed that way. Johnnie’s has a history which I have mentioned before: Elvis ate there, and my mother did, too – never at the same time, as far as I know. I’ve had a Johnnie’s dough-burger before, but it had traveled far and had to be warmed up. I wanted a fresh one, and I wanted the experience. Elvis’s booth was full, but I did get the booth next to his. The dough-burger, (which features flour and water in the beef mix to extend it – similar to Corinth’s slug-burgers) was much better in person. I had a fun discussion with Craig, the current owner’s son-in-law, who told me that the Dairy Kream just down the street was owned by another family member. I stopped there on the way out of town, because soft serve from a dairy bar seemed the right thing to do after a dough-burger. I surveyed the menu and discovered they had something called a Purple Cow. In my early days, Granny made Purple Cows by pouring Nugrape soda over vanilla ice cream (or ice milk, as she was prone to purchase). This one was a shake made from vanilla soft serve, grape soda, cherry soda, and Sprite – a different texture than Granny’s, but very similar in flavor. And a pleasant ending to a historic day of eating. During the first twenty-something years of my life in Starkville we certainly ate at restaurants from time to time. But there are not a lot of vivid taste memories from the first decade, particularly of dishes that were especially good. I guess that’s normal for a kid. Bad memories are few and far between as well, save that one oyster at Shoney’s and a spoiled carton of chocolate milk at the Ward Elementary cafeteria that still inspires full body shivers. As I progressed through high school the scene began to change. Early prom dates were honored with the cafeteria trays of the Western Sizzlin’; later ones got treated to the original location of Harvey’s. (Thank you Mr. Bean. Thank you so much.) Aside from the mainstay of Starkville Café, other places with memorable food began to pop up – Oby’s, Little Dooey, Bulldog Deli – places that I looked forward to coming back to over the next two decades when I lived far, far away. Four years ago, when we moved back to Starkville the scene had changed again. We got chefs. I know I’m probably going to get in some trouble saying this, so allow me this disclaimer. There were bound to be some chefs in Starkville in the seventies and eighties. Surely. But I wasn’t aware of them, and though good restaurants were discussed, individual chefs were not. Now, however, American culture has evolved from Julia Child and Yan Can Cook to the Food Network and Cooking Channel. Chefs have become celebrities and our taste buds are the beneficiaries. Beyond the celebrity aspect, chefs have become competitors, and it’s not limited to Top Chef, Man Vs Food, or the Next Food Network Star. Since my return to Mississippi I have been involved as a judge, coordinator, describer or eater in at least seven different cooking competitions in Starkville alone. The most recent was the Starkville Area Arts Council’s Forks and Corks event at Magnolia Manor. And let me just say…we got chefs. There were prizes, and I’ll tell you who won what as we go along. But for the sake of fairness, I’ll describe everything in the order in which we wandered. 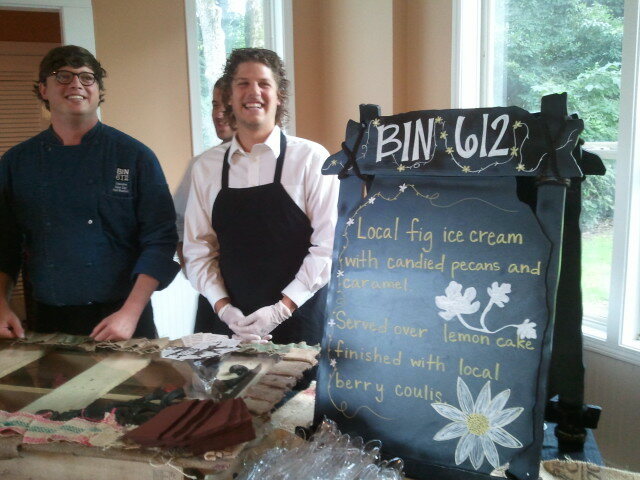 The first dish we chose was the fig ice cream from Chef Paul Brasfield at BIN 612. Dessert first, you say? Oh yes we did. We are adults. And it didn’t ruin our dinner one little bit. (Kids, don’t try this at home.) Chef Paul won the Presentation medal for this one: local fig ice cream with caramel and candied pecans, served over lemon sponge cake and finished with a local berry coulis. I’m not sure I’ve ever had fig ice cream before, but by golly if I ever have a chance again I’m going for it. People were still talking about it the next day. Hopefully, if there is a next time, Chef Paul will let me bring my Jethro Bodine-sized ice cream bowl and fill ‘er up. Next up was the Veranda. Chef Jay Yates took a simple Southern staple and gave it serious pizzazz. The base was a thick slice of Lancaster Farms green tomato, battered and fried as God intended. On top of that was a little mound of king crab and avocado salad, adding a rich, creamy element to the tart crispiness of the tomato. 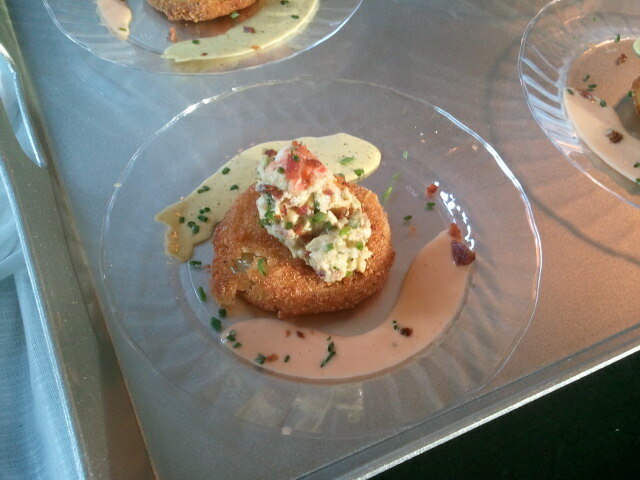 Then on the sides were two different sauces: cilantro lime hollandaise and sriracha honey aioli. I’m the kind of person who likes having choices, but doesn’t particularly like choosing. So I appreciated having both sauces – with the salad on top, I could create all kinds of unique bites, all good. My comment to the wife was that this was something I would definitely order at the Veranda. On the other side of the room, Chef Matt Bronski was dishing out the Harvey’s interpretation of one of my favorite dishes of all time. They called it Mississippi Gulf Seafood and Low Country Cheese Grits, but even that long name doesn’t begin to describe the plate. The grits were simple, cheesy and creamy, topped with butter-poached shrimp and lump crabmeat. But there was also a touch of cherry tomato salad with cucumber and fennel, and a little baby spinach on the side – all that in a pool of tasso ham, andouille sausage, and bacon gravy. But wait! There’s more! The grits were surrounded by a ring of flaky phyllo dough with dill pressed between the layers. As The Wife noted, there was a lot happening on this plate, and it was all right up my alley. Down the hall we found Chef John Fitzgerald of Restaurant Tyler, who won the Best of Forks and Corks (chosen by the guests) for his Smoked Catfish Tamale Cakes served over tomatillo salsa verde and topped with house-smoked bacon confit, herb crème fraiche and Vardaman sweet potato chips. I’m not a big tamale guy, but I could surely come to love them if they were all made like this. Bacon confit: French technique, meet Southern goodness. The last savory dish was prepared by Chef Leon Jefferson from Central Station Grill, who won the medals for Best Taste and Originality. It was surf and turf like I’ve never seen before. Pan-seared bay scallops wrapped with smoked brisket, a balsamic-infused white barbecue sauce, and Florentine potatoes. I hate to say it, Bacon, but your days of monopolizing the scallop-wrapping business might be over. This worked. We started with dessert; we ended with dessert. Chef Barbara Vasser from Aramark began with a base of sponge cake, added a thick layer of what she called cheesecake mousse, another layer of strawberry cheesecake mousse, and finished it with a drizzle of strawberry daiquiri sauce. Cool, creamy, and just right for the warm summer night. We are Starkville. And we got chefs.